Border crossings. In this day and age, shouldn’t it be fairly easy to cross a border between one country and another? Of course, I say this knowing that perhaps one of the hardest countries to enter in the entire world is my own. Perhaps the last few days have been intended to partly equalize that karmic inequality. I was in Nairobi for few days attempting to get my Sudan visa (a country that is difficult to enter for good reason – they don’t want anyone in there to perhaps tell the outside world what is going on there, between the ongoing problems in Darfur, Southern Sudan looking for independence, and China trying to make it another one of their provinces because of the presence of oil). I finally got fed up with the Sudan Embassy in Nairobi and decided to head to Addis Ababa to get my Sudan visa there, on the advice of a number of different people that said it would be easier to accomplish there. I’ll skip over the details of how I got from Nairobi to Moyale for another blog. Suffice it to say that the 850 kilometers took me three full days to transverse. One day by bus and two days in the bed (and on top of) a medium-sized lorry. It was entertaining. I didn’t end up getting to Moyale until about 6 p.m. on Friday night. 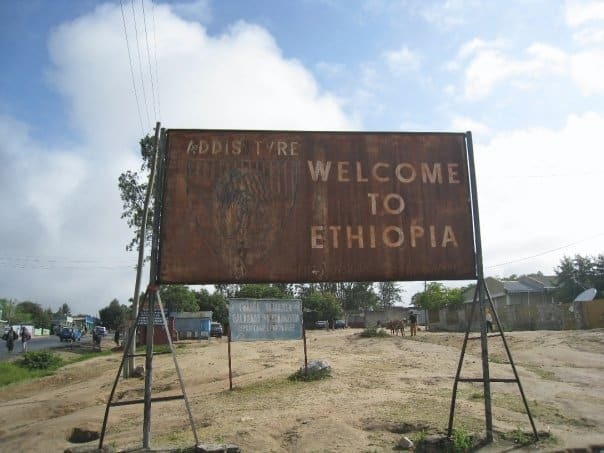 I’d read in both the guidebooks and from various travelers’ blogs that the buses from the Ethiopian side of the border onward to Addis Ababa all left before the border crossing opened – and I’d arrived after it had closed for the day. So, I checked into a hotel on the Kenyan side of the border, spent the night (though the shower didn’t work, so the filth of the last three days lingered on), woke up the next morning and proceeded to the border. I expected to get through the border crossing, find a hotel on the Ethiopian side to spend the day and evening in and depart before dawn on Sunday morning for the day and a half trip to the capital. I should insert here that I not only asked at the U.S. Embassy in Nairobi (while there to see about my Sudan visa), but also read in my recently issued guidebook, and read online from at least three different sources, that I could get my visa into Ethiopia at the border post in Moyale. The same as I have done in every single country so far in Africa. When I walked into the Kenyan border post to check out of Kenya, the agent there asked if I had an Ethiopian visa. I told him that I’d been told I could get one at the border. Very nicely, he told me that wasn’t the case, that he wouldn’t stamp me out of Kenya yet and that I should go to the other side of the border to see if they’d let me in first. He also said there was another muzungu (white person) in the same situation that had just walked over to the other side. I walked over to the Ethiopian side and was quickly informed, again quite nicely, that they didn’t issue visas at the border and that I’d have to go back to Nairobi and get one there. The other guy in the same situation, Paul Harbidge, was a Brit on a motorcycle trip from Capetown to Cairo with five of his friends for charity. His story about being misinformed about the visa situation was much worse than mine. When Paul got to South Africa to hook up with his friends, all six of them sent their passports to the Ethiopian Embassy in Johannesburg to get their visas. The embassy issued visas for the five South Africans, but returned Paul’s without a visa, telling him that a British citizen needed to get one at the border crossing upon entering. Thinking it made little sense to not just issue it then, since he was asking for it in advance, he called the Ethiopian Embassy in London and was told the same thing in that office – you need to just get one at the border. Of course, when he got to the border, the agents there told him that he needed to get one in advance and they couldn’t issue one. Paul had made friends with another group of South Africans that were crossing in a Land Rover. One of them knew the South African Ambassador to Ethiopia and managed to get him on his cell phone. On a Saturday morning — very impressive. 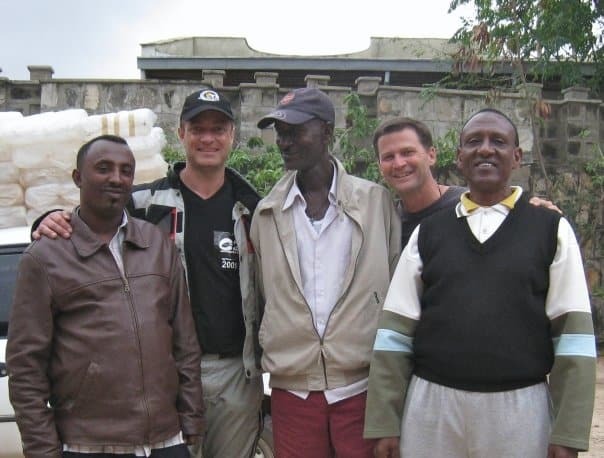 The Ambassador talked to the agent in charge at the border for a while, but he couldn’t talk him into letting Paul – and now me, since I’d latched into this effort – into Ethiopia. Adan, the Ethiopian guy in charge, said we had two and only two options. Either we could get some official document from his superiors in Addis Ababa faxed to him, saying we could come in, or we had to go back to Nairobi and get a visa from the Ethiopian Embassy there. Option two entailed a minimum of a 4-5 day round trip, down and back some of the worst roads I have ever encountered. It was not a tasty option. Paul and I immediately decided that option was our last resort. We asked Adan if the other bikers went ahead with copies of our passports, got visas issued for us in Addis and faxed them back to him, he would accept that and we were assured that would be fine. We also got the name of the person in Addis that was in charge of the immigration department. Paul and his friends had a fixer in Addis that had helped them on the particulars of the trip and between that person and their contacts in South Africa, they thought they might be able to get through to that person and get approval for Paul and I.
Paul and I gave Mark , one of the bikers, photocopies of our passports and extra passport photos, to see if he could arrange visas for us on Monday morning in Addis Ababa, the capital of Ethiopia. We had the name of the head guy in charge of immigration that they needed to convince. They had a long ride ahead of them and they left around mid-day on Saturday, so they could get to Addis Sunday night, in case we needed them to exercise that option Monday morning. NEWS BREAK: As I sit here typing this, at 5:30 p.m. Sunday night, Paul just hurriedly knocked on my door and said, “we have to go to the border now – supposedly we have approval. Now!” It will be our fourth or fifth trip to the border in two days – I’ve lost exact count. Now back to the story in chronological order. Paul had a local guy also assisting him, named Hadj. Hadj is a 56-year-old former English teacher from Moyale on the Kenyan side. As we learned over the new few days, he had lived in Moyale for most of his life and had relatives all over the place. In his son’s shop, I used the photocopier to make copies of the pages in my passport. We ate lunch Saturday and Sunday at a place owned by his sister-in-law. His brother-in-law owned the hotel we stayed at. Sunday after lunch, we went by his house and met some nieces (one of which wants to go to medical school somewhere in the West and Hadj was joking about her marrying either Paul or I for the visa), nephews, grandchildren and Hadj’s 83-year-old mother, sick in bed. After our initial visit to the border, Hadj took us back to the hotel and Paul started making some calls to people that might be able to help. He called the person that organized the trip in South Africa and got him calling around and also called Tsegaye Asfaw, their fixer for Ethiopia, and got him calling around. Rsegaye called back and told him there was a letter from the Ethiopian Trade Ministry that said there were 38 countries, including the U.K. and the U.S., that could get entry visas at any border crossing and said he was going to fax it to us, so we could go and show it to the agents. He also said that he had contacted a person on the Ethiopian side of the border who would meet us at the office at 3 p.m. that afternoon. Hadj found a place in town we could fax the letter to, Paul called Tsegaye and gave him the number, and we waited. And waited some more. The fax didn’t come in and all of Paul’s calls to Sergey went directly to his voicemail. We later found out that this information in the letter might have been true at one point, but it doesn’t appear to be true anymore. Although we still aren’t totally sure, it appears that you can only get an entry visa upon entry at the Addis Ababa airport, if you enter via plane. Hadj took aside Adan and the other guy that appeared in charge on this trip over and told them that we were willing to make a payment of $300 U.S. to them, if they could see clear to letting us pass the next day. Perhaps the two of them could call and explain the situation to someone in Addis that could approve our entry and then we’d be on our way. The two agents told Hadj they would ‘work on it,’ but they couldn’t promise anything. They told us to come back tomorrow morning at 8 a.m., before the border opened at 9, and perhaps we could get in. We went back the next morning at 7:30. No sign of Adan or the assistant. Paul and I sat at a coffee shop next to the immigration office while Hadj went around to see what was going on. Some local Ethiopians that knew Hadj came at sat with us for coffee and told us that this issue came up with reasonable frequency – at least 5-6 people a month were in the same boat as us. We asked them what happened in those cases and they said that sometimes the people turned around to Nairobi and got the visa there, but sometimes they were let through. The best advice they could give us was to make it clear that there was no way we were turning back to Nairobi and contact anyone we knew that could somehow exert pressure on the people we needed to convince in Addis. Hadj came back and told us that he’d found the overall supervisor for the Ethiopian border office and that this person was going to meet with us away from the office. He said that he was friends with a mutual friend of the supervisor and that he’d be assured that we could get this all worked out. It was unclear if there needed to be some sort of payment made. So we went to the other location. It was a barbershop. The mutual friend of Hadj’s and the supervisor’s was their barber. Seriously. We waited there a bit and then the barber and Hadj jumped in a cab to go talk to the supervisor at some other location. They came back and told Paul and I to jump in the cab and we rushed off back to the border office. We were assured by Hadj and the barber we were getting the visa in minutes. And we got rejected again. I was never sure on the details, but Hadj said he repeated the offer of $300 and was told that money wasn’t the issue – the agents were afraid of getting in trouble with someone at the capital if they let us through. They said they had talked to the head immigration guy in Addis the night before and he wasn’t going to let us in. A few hours later, Tsegaye called Paul back and said he had also talked to the head immigration guy and that was true. He wasn’t going to let us in. But Tsegaye also assured us that once Mark and the other bikers got to Addis with copies of our passports that we could get visas issued in that manner, which makes sense, because tour operators do that sort of thing all the time – sending passports off to get visas. I didn’t have much hope of the Sunday bribery plan from the beginning. When Hadj was talking to Adan and the other guy the afternoon before about us making a payment to grease the wheels a bit, my read of their body language was that wasn’t going to fly. So, we went back to the Kenyan side to get some lunch and relax at the hotel. I was actually quite confident that Mark and the others would get us visas in the morning in Addis, fax them down, and we’d be on the road by mid-afternoon, at the latest. It’s the optimist in me. It is a bit funny — before I left on my trip, I told a number of people back home that I wanted to come back with a “bribing a border crossing agent” story. Now that I was actually in that position. . . I was less enthused about the story. Then came a couple of phone calls came on Sunday afternoon. Mark was calling from Addis. He’d been on the phone with a few people trying to pull some strings since he’d arrived in Addis and initially it didn’t look good on that front. He was still optimistic about getting a visa through the normal channels, but it didn’t look like we could cross until Monday at the earliest. Then Paul came and knocked on my door at 5:30, with the “let’s go” message. We rushed off in a cab to the other side of the border and Paul explained that ten minutes after the last no-go call came, Mark had called back and said that he’d gotten us approval to get stamped in, but that we had to go to the border immediately. Paul had no idea who Mark had talked to in order to get approval and we had no idea if that person had called the border to get the information to Adan and the other guy (I think it later turned out to be someone high up in the Ethiopian Foreign Office). And we were fairly certain that the office was going to be closed at this time of the day also. Now that I write that, I remember there was another trip earlier to the border crossing post. I forget the details of how we were crossing that time, but it didn’t matter — everyone was gone for lunch. Apparently the whole office closes for two hours at lunchtime. When the cab got to the military checkpoint on the Ethiopian side (the military guys knew us on sight by this time), Adan was there to meet us with a smile. The call had obviously gotten through to him. 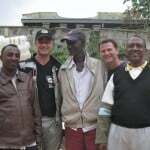 He and his assistant opened the office back up and warmly welcomed us to Ethiopia. They explained a couple of times that it wasn’t their decision to give a visa or not – it was up to someone higher up – which was undoubtedly true. Nonetheless, Hadj suggested that Paul and I each give $50 U.S. to them. Merely as a thank you for opening the office back up and stamping us in at this late hour, of course. Fine by us, just as long as we got the damn stamp letting us in. And get it we did, though we still don’t have the visa. We have the entry stamp in each of our passports, but when we get to Addis, we need to go get the actual visa from the appropriate office. That is the subject of yet another blog. And now, Paul just knocked on the door. Time for a cold beer. A really, really good cold beer. And then a two day ride to Addis in a truck. This is one of my favorite posts of yours. I think because it creates so much tension, then has a good resolution. But wait! There's more! Will you get the actual visa in Addis?? ?